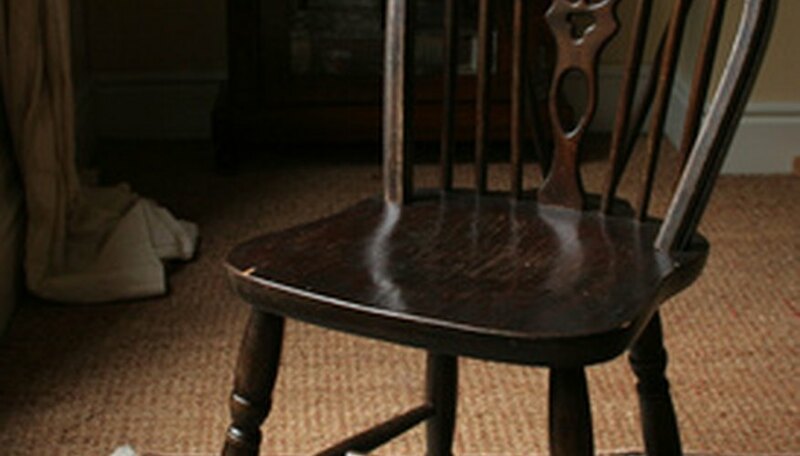 Chairs are made from a variety of materials but wooden chairs are still the most common type of chair. Whether they are made from solid wood, hardwood, softwood or a modern artificial composite or engineered wood, chairs consist of a few basic elements that have stayed the same throughout the centuries. If you are doing a home improvement craft project to make a chair or if you simply want to update and change an existing chair, you may want to know how to attach the chair legs. Prepare the chair for the leg attachment by turning it upside down on a flat, even and firm working surface. Hold the leg to the seat to find the best position. Use a marker to indicate the outline of the chair leg base on the seat, thus indicating the places for the screws as well. Drill four holes in four corners of the chair seat. Be sure to drill in the center of the chair leg base outline. Since you will be drilling while the chair is turned upside down, the holes will be on the bottom of the seat. Make sure not to penetrate all the way through the chair seat with the drill. These holes have to be compatible with the four screws you will install into the four legs. The holes should always be slightly smaller that the matching screws. Drill a hole for the screw at the top of each of the legs. Use a power drill for this task, while the chair leg is firm and secure in a vise tool. Make sure that the hole is in the center if the leg, so that the outline indicated on the seat will be accurate. Install a t-nut on each of the four corners of the seat. Use a hammer to secure the nut in its place and make it firm and stable. Screw the chair leg onto the t-nut, rotating it until the leg base reaches the seat. A t-nut is similar to an ordinary screw and will keep the chair leg firmly in its place. For extra stability, add a few drops of wood glue on the nut before screwing on the legs. If you want an easier solution for attaching the chair legs, use special leg plates for the attachment process. Using carpentry tools is potentially dangerous so use extreme caution and make sure to wear protective working gloves at all times.